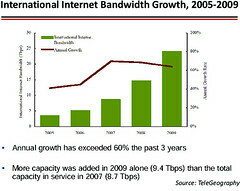 David G. Ross ofThe David Ross Group Inc. at NANOG 50 talked about data cables under the sea, in which he revealed that Internet growth has not only not paused during the recession, it has increased, and it continues to increase in every region in which his company operates, including Asia, Middle East, and Africa. North Atlantic hasn't had any new submarine capacity in years, in "the most competitive capacity market on Earth". It will probably run out in a few years, so now there is demand to build new cables there. Each cable costs about $200 million to install. Slight downside: early remark that he was sure things were the same as they were when he worked for a telephone company.